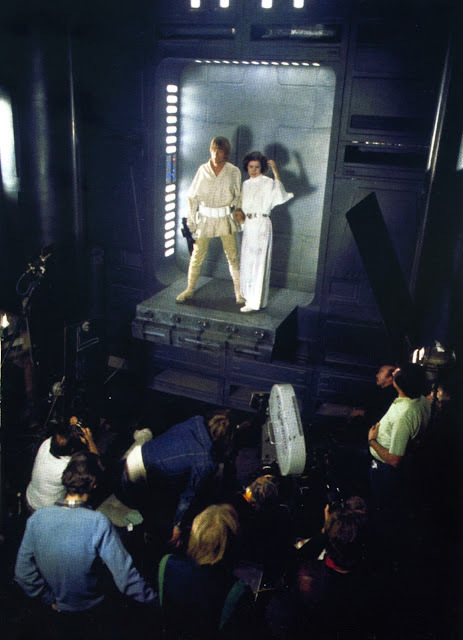 The famous Luke and Leia swinging over the chasm scene was filmed for the first Star Wars movie in 1976. Mark Hamill and Carrie Fisher practiced their moves over the course of a number of takes. They completed the highly choreographed scene by jumping onto a crash mat that was right in front of them. The famous 'for luck' kiss was something which George Lucas said he wanted to cut. However his then-wife Marcia - one of the movie's three Academy Award-winning editors - convinced George to keep it in. The Star Wars director did cut the rest of the line: "For luck. We're going to need it," to just the first line. Take a look at the full scene down below starting from when Han goes on a mad charge through the Death Star. Many of the clips of this behind the scenes clip come from the enhanced e-books of The Making of Star Wars released in 2008 where J.W. Rinzler looked into a high volume of what wast unreleased content from the Lucasfilm archives.